All we do begins with a thought. ~ In other words: The Want To (Thought) and The Want To, Do (Action). To achieve success, there must be: “The Want To” — That’s the thought. Then, there must be: “The Want To, Do” — That’s the action. Knowing and Doing are two very different aspects of life. One is passive. The other is active. One is a state of mind. The other is the motion of the body. One without the other is of little value. Recently, a story about Coach Wooden grazed my consciousness. Then, it began to burrow deep into my soul. Now, that thought has become an action — to share my discovery with you. That high level of excellence was built — block by block — from the blueprint of Coach John Wooden. It was much more than a game plan. It is a philosophy of life and competition. 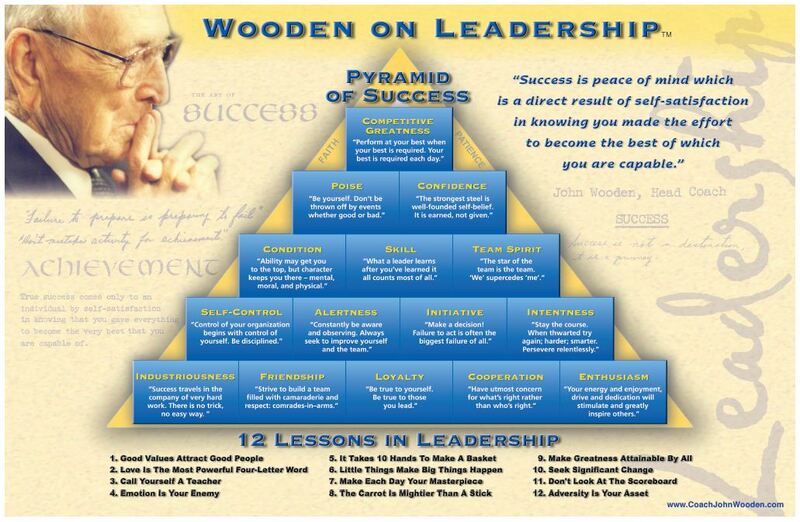 As timely today, as it was for his century of performance, Coach appropriately named it a Pyramid of Success. At the heart of everything I know about Coach Wooden, he was respectful of Time and Tone. Practices began and ended like clockwork (Time). He opened the first moments of practice in a quiet voice (Tone). The passion at his core produced Planning, Preparation, and Progress to reach Goals. The thought was to encourage the development of their best — from everyone within his sphere of influence (the Goal). The actions were focused on Planning (Pyramid of Success), Preparation (How to Tie Shoes), and Progress (National Championships). Thought without action is worthless. Action without thought is dangerous. Be sure to click on Pyramid of Success, at the top of this page. Coach starts his building process, at the lower left corner. Industriousness is the first cornerstone in the foundation of the Pyramid of Success. The second cornerstone, to the far right, is Enthusiasm. Click on each building block for the rest of the story. In our daily conversations, with one another, we Talk about these principles. Funny, though, isn’t it? So easy to say — yet, so, very, hard to Do. Coach simply inspires and encourages us to remember and do.